With the state going to polls on April 23, political parties, their candidates and foot soldiers have been hit the hardest by rising mercury levels. Staying within the shade of the vehicle, Remya spoke, hardly for two minutes, repeating the same speech she made at the last stop about how, if elected as an MP, she would meet the developmental needs of the largely rural, agrarian constituency. It is nearly 11 am and the sun is beating down with all its might on the tiny town of Puthunagaram in Kerala’s Palakkad district. In a corner of the main town junction, flyers and posters of Congress can be seen fluttering, helped by a gentle breeze. 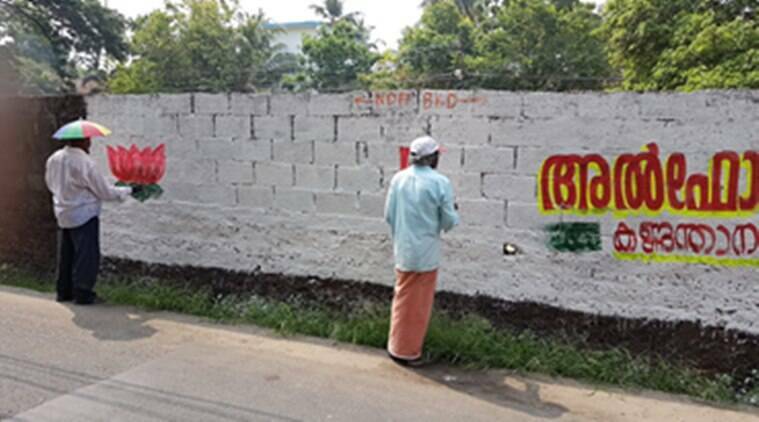 In the distance, the faint sound of a loudspeaker hints that Remya Haridas, the young Congress candidate from Alathur parliamentary constituency, is approaching the town for a roadshow. After what seemed like ten minutes, the first glimpse of the Congress roadshow was visible. While the candidate stood on top of a mini truck, protected by shade, waving wildly at people, a couple of cars with local Congress leaders, followed. A jeep with a man holding a microphone and carrying large speakers preceded the candidate’s vehicle. Two young men on bikes, with green flags of Congress-ally Indian Union Muslim League (IUML) fitted on its handles, completed the convoy. The convoy stopped a few hundred metres ahead of the town junction, where a bunch of men, women and children were waiting to receive Remya. There were schoolgoing girls holding flowers and scarves of Congress. “We are sorry to have kept you waiting for some time, especially in this heat, but there were massive crowds at the last stop. That delayed us. Remya will speak a few words and then we have to move on,” a man spoke into the microphone before handing it over to the candidate. 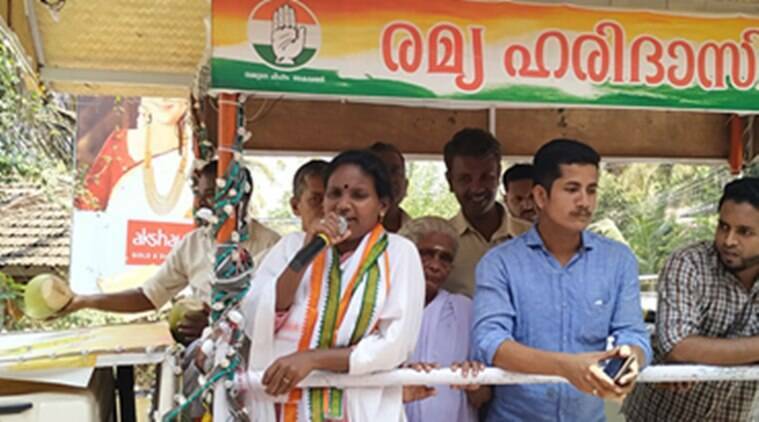 Staying within the shade of the vehicle, Remya spoke, hardly for two minutes, repeating the same speech she made at the last stop about how, if elected as an MP, she would meet the developmental needs of the largely rural, agrarian constituency. That the heat and exhaustion were taking a toll on her, a debut candidate in the parliamentary polls, was evident in her strained voice. She even obliges to a couple of selfie requests by young men and women. By then, a party worker brings her a couple of tender coconuts from a nearby shop. Another man packs in a bunch of bananas in a polythene cover, handing it over to her. The convoy moves on. Palakkad, along with most other districts of the state, is experiencing an extraordinary heatwave, with maximum temperatures rising two to three degrees above normal. In an ideal situation, Remya would have got down from the vehicle, clasped voters’ hands, hugged them in return for a promise of votes, lending a personal touch to her campaign. But the sun is too harsh, she knows, and besides, she has to make over three dozen stops like these before winding up the campaign by 10 pm at night. Palakkad, along with most other districts of the state, is experiencing an extraordinary heatwave, with maximum temperatures rising two to three degrees above normal. The heatwave has added to the weather abnormalities that the state has been facing, just months after it went through the worst floods in a century. Last week, Puthungaram and other towns in the district sizzled at 41 degrees with most people choosing to stay indoors in the afternoons unless absolutely necessary. Just last week, two cases of sunstroke and 12 cases of sunburn were reported in Palakkad district alone. The ruling Left Democratic Front (LDF) government has prohibited all labour activities between 12 noon and 3 pm, vowing to penalise contractors who force labourers to work in these hours. Additionally, the state disaster management authority asked the public to avoid exposure to the sun in the afternoon, wear light-coloured clothes and drink lots of water and fluids to remain hydrated. With the state going to polls on April 23, political parties, their candidates and foot soldiers have been hit the hardest by rising mercury levels. While some parties have tweaked their campaign timings, asking workers to avoid the afternoon sun, others like Remya have no choice but to toil in the heat to cover multiple areas. Last week, Puthungaram and other towns in the district sizzled at 41 degrees Celsius with most people choosing to stay indoors in the afternoons unless absolutely necessary. “Yes, we know the heat is unbearable, but there’s nothing we can do. For lunch, we take a one-hour break, that’s all. Otherwise, our campaign runs from morning till night,” says Gopinath, the president of the Congress Alathur parliamentary constituency. Remya, who’s making her debut in the Lok Sabha elections against two-time CPI(M) MP PK Biju, is feeling the heat too. With the constituency largely rural and covering swathes of areas spread over Thrissur and Palakkad districts in central Kerala, Remya possibly has to face the harshest of weather conditions. Areas like Chittur, Tarur and Nemmara report temperatures above 35 degrees in the summer months. MB Rajesh, the sitting MP from Palakkad constituency who has been nominated again, speaks of suspending campaign between 11:30 am and 3 pm even though they sometimes go overboard. “We have told our party men to take care of themselves while campaigning. Thankfully, there haven’t been any incidents of sunstroke,” he adds. Rajesh keeps himself hydrated by drinking lots of water, tender coconut juice, watermelon juice and spiced buttermilk. 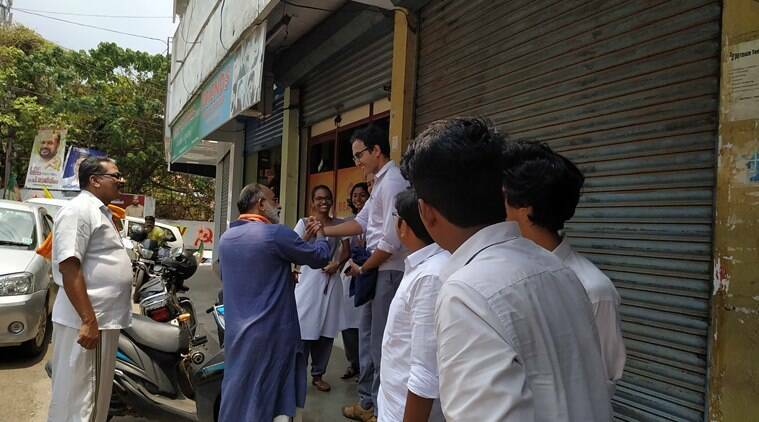 Prof VT Rema, the BJP candidate from the Ponnani constituency, says while it was not possible to change campaign schedules according to the heat, party workers have been instructed to go for door-to-door campaigning only after 4 pm.”The heat is definitely a problem, but we’re trying to avoid the sun and focusing on meeting people and understanding their problems. After all, as they say, one who is born out of fire will not wilt in the sun,” she adds over the phone. Further south, Minister of State for Tourism and Rajya Sabha MP KJ Alphons is beating the heat in Ernakulam constituency in central Kerala.